Note: Please keep in mind that my recipes reflect only my own experience, and that if you choose to follow them you do so at your own risk! In the spring I shared my recipe for chocolate cupcakes and vanilla frosting, and now here's the reverse! It's taken me a while to develop a recipe for vanilla cake that's easy, egg-free, mixer-free, and lighter than other recipes, since these properties can often make cake taste more like a muffin or quick bread. But this summer I've hit upon the secret: using instant pudding mix in the batter. It's an old trick often used with boxed cake mixes to give them an extra-moist texture, and it does that here as well as substituting for the binding properties of an egg--just make sure to use organic instant pudding mix to avoid additives and artificial ingredients. * Einkorn flour is made from an ancient variety of wheat and is naturally moister than all-purpose flour. If you substitute all-purpose flour, you may need to add 1-2 extra tablespoons of water. 1. Preheat the oven to 350 degrees Fahrenheit. Line two cupcake pans with sixteen parchment cupcake wrappers, or grease a 9-inch square cake pan. 2. In a large mixing bowl, stir together the sugar and melted butter. Stir in the vanilla extract with 1/4 cup of the milk. 3. Stir in 1/2 cup of the flour, the dry pudding mix, the baking powder, and the salt. Alternate the remaining milk 1/4 cup at a time with the remaining flour 1/2 cup at a time, finishing with the last 1/4 cup milk. 4. Spoon the batter into the lined cupcake pans until it is evenly distributed, or pour the batter into the greased cake pan. 5. Bake the cupcakes until they are springy and a toothpick inserted into the middle of one of the center cupcakes comes out clean, about 25 minutes. Bake a round or square cake until a toothpick inserted into the middle comes out clean, about 30-40 minutes. 6. Carefully remove the cupcakes from the pan and place on a wire rack to cool, or let a round or square cake cool in the pan. Wait until the cake is completely cool before frosting. 1. In a medium mixing bowl, stir together the melted butter and vanilla extract. Sift in the cocoa powder a stir with a fork to combine. 2. Sift the powdered sugar 1/4 cup at a time into the melted butter, beating with a fork after each addition. When the mixture becomes stiff, add a little milk, one teaspoon at a time--the frosting thins out easily with just a small amount. 3. Scrape down the sides of the bowl with a rubber spatula to incorporate all the powdered sugar, and add any remaining milk to reach your desired consistency. 4. 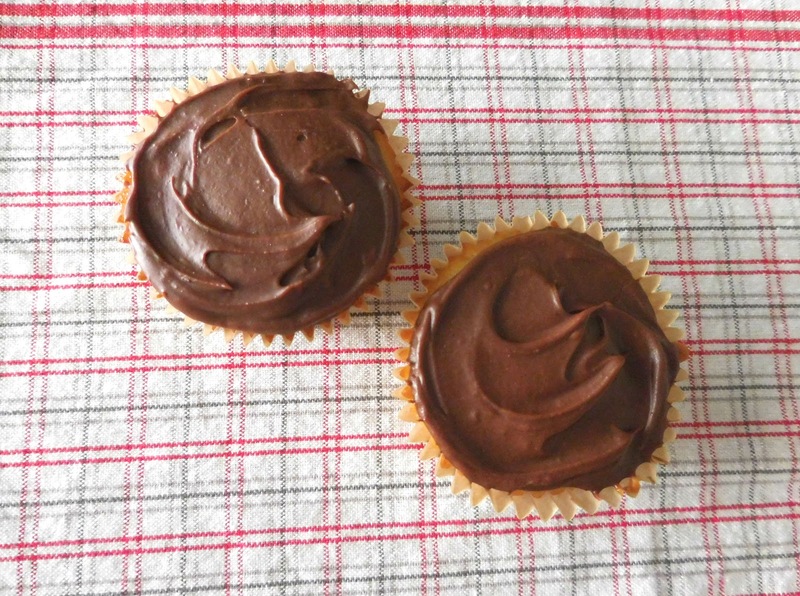 Spread the frosting using an offset spatula or butter knife onto the completely cooled cupcakes or cake.